(Grades 2-6) A storm is brewing... Whenever Levi doesn't like the truth, he kinda, sorta makes up other stuff to say. One day his mother explains to him that telling lies will damage the trust of his friends and make him very sad. "Whenever you tell a lie, your inside sun goes away. Then a lying cloud forms, and glooms up your day. Each time you tell a lie, another cloud starts to form, and before you can stop it from happening, your insides start to storm." This book is a great resource to help children understand not only the consequences of telling a lie, but also how one lie can often lead to telling several more. It will help parents and teachers understand that lying can be a normal and sometimes healthy response for a child and offers tools to help guide children toward truthfulness. Paperback, 32 pages. Lying produces both internal and external consequences. 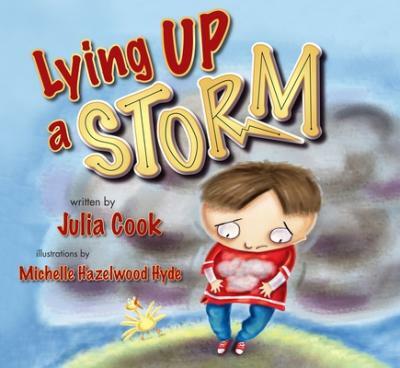 Julia Cook uniquely teaches children the internal repercussions of their fibs in "Lying Up A Storm." As in all of Julia's books, her characters are easily relatable for children. -- Katherine Robbins-Hunt, Ph.D. Professor of Special Education "Edinboro University"